The astronomical theory of ice ages based on the Milankovitch mechanism has become the ruling paradigm of Pleistocene paleoclimatology. It is even used to date sedimentation during the pre-Pleistocene period. However, there is little, if any, physical basis behind it. It does not provide a mechanism for the sudden onset of the ice-age cycle at 2.7 Ma, nor why the 41-kyr tilt cycle predominated between 2.7 and 0.9 Ma, why it shifted to the 100-kyr cycle at 0.9 Ma, how the very weak 100-kyr eccentricity cycle could even affect solar radiation, and why such weak changes in solar radiation could produce such dramatic climate changes as ice ages. The Milankovitch hypothesis was supposedly ‘proved’ by statistical matches with deep-sea cores obtained in the 1950s through to the 1970s. However, cores require very accurate dating, which was beyond the state of the art back then. The fact that the Milankovitch hypothesis is so strongly believed attested more to the reinforcement syndrome. Figure 1. The net change in solar radiation in langleys per day received at the top of the atmosphere in the Northern Hemisphere caloric summer for an assumed time interval of 160 years in the past to 50,000 years in the future.43,44 Minus latitude is for the Southern Hemisphere. A Caloric summer is the warmest half of the year. Units are in thousands of years. (From Vernekar.38). There are three cycles, termed the Milankovitch cycles, that result in slight changes in the earth’s orbital geometry around the sun.4 The first is the earth’s eccentricity, in which the elliptical orbit of the earth cycles every 100 kyr between an eccentricity of near zero to almost 0.06. The eccentricity also has a longer-period 413-kyr cycle that some scientists believe to be important. It is controversial as to whether this cycle shows up in climate variables. The second is the tilt of the earth, which oscillates between 22.1° and 24.5° with a period of 41 kyr. The third Milankovitch cycle is the precession of the equinoxes, in which the equinoxes rotate around the orbital ellipse of the earth with a period of around 22 kyr. 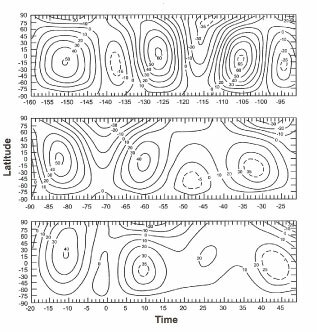 The net effect of all three cycles results in a slightly different distribution of solar radiation between the seasons and latitudes with time (figure 1). However, the net solar radiation remains the same over the earth. Scientists have become so certain of the theory that they have ‘tuned’ or modified climatic data sets to the Milankovitch cycles. This is circular reasoning and is one reason why these data sets match Milankovitch oscillations so well. The astronomical theory is considered so well established that it has become the ruling paradigm in climate research. All climate data and Quaternary dating mechanisms are fit to the theory, including deep-sea cores, ice cores, pollen cores and lake sediment cores. Scientists have become so certain of the theory that they have ‘tuned’ or modified climatic data sets to the Milankovitch cycles. Needless to say, this is circular reasoning and is one reason why these data sets match Milankovitch oscillations so well. The Milankovitch mechanism has become such a dominant paradigm that geologists have extrapolated the theory to account for pre-Pleistocene cyclic sedimentation.7 Such cyclical sedimentation includes limestone-marl, limestone-black shale and sandstone-shale vertical rhythmites. Geologists have used Milankovitch oscillations to date sediments throughout the Phanerozoic part of the geological column—clear back to the Cambrian. The geologists first date certain portions of the strata and then use statistical matches with the three Milankovitch cycles to verify their finer chronology between dates. However, there are numerous problems with the astronomical hypothesis.12–17 These problems continue to plague the hypothesis and have been emphasized in recent articles. How does the ice age cycle begin? The most obvious problem is why should the ice age cycle begin about 2.7 Ma when the Milankovitch cycles supposedly have existed for many hundreds of millions of years? Why does the Ice Age cycles change from a 41-kyr to a 100-kyr cycle? Why didn’t the glacial/interglacial cycle change to a 70-kyr or 150-kyr or some other cycle, rather than another Milankovitch cycle? I suggest it is the reinforcement syndrome of the Milankovitch hypothesis described below that causes researchers to believe Milankovitch cycles are the only ones available. So, according to this thinking if one Milankovitch cycle ends, then another cycle must take over. We don’t understand why ice ages occur in both hemispheres simultaneously when the changes in solar irradiance from orbital variations have opposite effects in the north and south.—D.P. Schrag. Paleoclimatic researcher William Ruddiman suggests four possibilities to account for this cycle: (1) other external forcing, (2) natural resonance or free oscillations in the climate system, (3) non-linear responses within the climate system that transform the tilt and precession cycles into a 100-kyr periodicity, and (4) non-linear amplification from other climatic variables.30 For the first suggestion, it has been proposed that ice ages would cycle every 100 kyr as the earth passed through regions of varying interplanetary dust.31 This idea has been considered disproved.30,32 The idea of natural resonance, the second suggestion, is unlikely also, especially because this ‘resonance’ would have to be suppressed for the ice ages between 2.7 and 0.9 Ma and then suddenly switched on at 0.9 Ma. The third suggestion, nonlinear forcing by the tilt or precession cycles, has been studied for many years, but nothing significant has been found. There is a huge body of literature on the fourth suggestion of non-linear amplification of the eccentricity cycle, but nothing definite seems to have resulted from this effort.33 It has been suggested that changes in CO2 and snow-albedo feedback somehow amplify the 100-kyr signal. However, the climate effect of CO2 is overblown34 and the snow-albedo feedback operates only after a cooling trend begins by some other mechanism. What about the statistical match? It seems like mainstream scientists cannot explain much about the Cenozoic ice age period: how it started, why the phase was the same in both hemispheres, why there is a 41-kyr cycle, why this cycle changed to the 100-kyr cycle, how the very weak 100-kyr cycle can work and the small effect on the solar radiation. I will add at this point that the argument even for multiple ice ages is weak as evidenced from terrestrial sediments.37 The idea of multiple ice ages has generally been assumed from oscillations in certain deep-sea variables, such as oxygen isotope fluctuations (figure 2). The only thing going for the Milankovitch mechanism is the statistical match with deep-sea cores. Why are there such good statistical correlations between Milankovitch cycles and other climatic variables? We still don’t know how subtle changes in the pattern of solar irradiance are amplified to produce such spectacular changes in climate—cooling the deep ocean almost to the freezing point and extending ice sheets thousand of kilometres towards the Equator.—D.P. Schrag. Broecker went on to claim that the Milankovitch mechanisms were verified by ‘accurate dating’ of deep-sea cores. However, he found the tilt and precession cycle predominant in the cores over the past few hundred thousand years: ‘Changes in climate occur in response to periodic variations in the earth’s tilt and precession.’42 Although the tilt and precession cycles still show an influence, the uniformitarian ice ages are now seen as oscillating according to the eccentricity cycle. Although Milankovitch cycles are believed to be the cause of dozens of ice ages during the late Pliocene and Pleistocene of the geological column, there remain many unresolved problems. The physical mechanism for uniformitarian ice ages, and the details of those ice ages, is quite weak. The Milankovitch mechanism is believed because of statistical matches between solar radiation at 65°N and supposed climatic variables measured in deep-sea cores, mainly oxygen isotope variations. But it is also difficult to believe how Milankovitch cycles can be detected within pre-Pleistocene sedimentary rhythmites. High precision dates from radiometric, biostratigraphic and paleomagnetic methods are necessary to relate deep-sea cores and sedimentary rhythmites to orbital variables. The accuracy required of the dating methods was beyond the state of the art during the 1950s to the 1970s for such supposed accuracy as Milankovitch cycles. The whole paradigm continues today as a reinforcement syndrome. 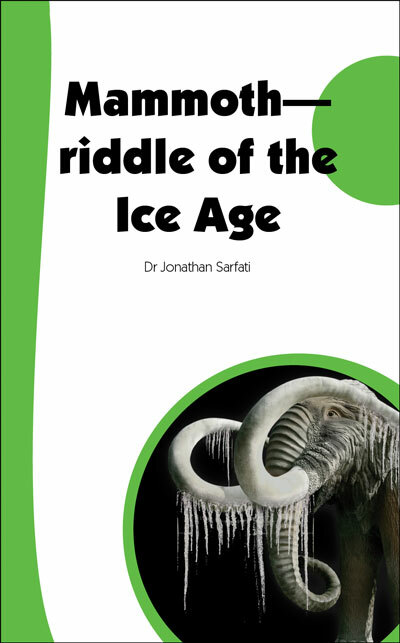 Chapter 16 What about the Ice Age? Emiliani, C., Pleistocene temperatures, Journal of Geology 63:538–578, 1955. Return to text. Hays, J.D., Imbrie, J. and Shackleton, N.J., Variations in the earth’s orbit: pacemaker of the ice ages, Science 194:1121–1132, 1976. Return to text. Imbrie, J. and Imbrie, K.P., Ice Ages Solving the Mystery, Enslow Publishers, Short Hills, NJ, 1979. Return to text. Oard, M.J., The Frozen Record: Examining the Ice Core History of the Greenland and Antarctica Ice Sheets, ICR Technical Monograph, Institute for Creation Research, Santee, CA, pp. 111–115, 2005. Return to text. Kennett, J., Marine Geology, Prentice-Hall, Englewood Cliffs, NJ, p. 747, 1982. Return to text. Wilson, R.C.L., Drury, S.A. and Chapman, J.L., The Great Ice Age: Climate Change and Life, Routledge, London, p. 26, 2000. Return to text. Oard, M.J., Are pre-Pleistocene rhythmites caused by the Milankovitch mechanisms? Journal of Creation 11(2):126–128, 1997. Return to text. Rutherford, S. and D’Hondt, S., Early onset and tropical forcing of 100,000-year Pleistocene glacial cycles, Nature 408:72–75, 2000; p. 73. Return to text. Crowley, T.J., Kim, K.t-Y., Mengel, J.G. and Short, D.A., Modeling 100,000-year climate fluctuations in pre-Pleistocene time series, Science 255:705–707, 1992. Return to text. Goodwin, P.W. and Anderson, E.J., Punctuated aggradational cycles: a general hypothesis of episodic stratigraphic accumulation, Journal of Geology 93:515–533, 1985. Return to text. Oard, M.J., Ice ages: the mystery solved? part I: the inadequacy of a uniformitarian ice age, Creation Research Society Quarterly 21(2):66–76, 1984. Return to text. 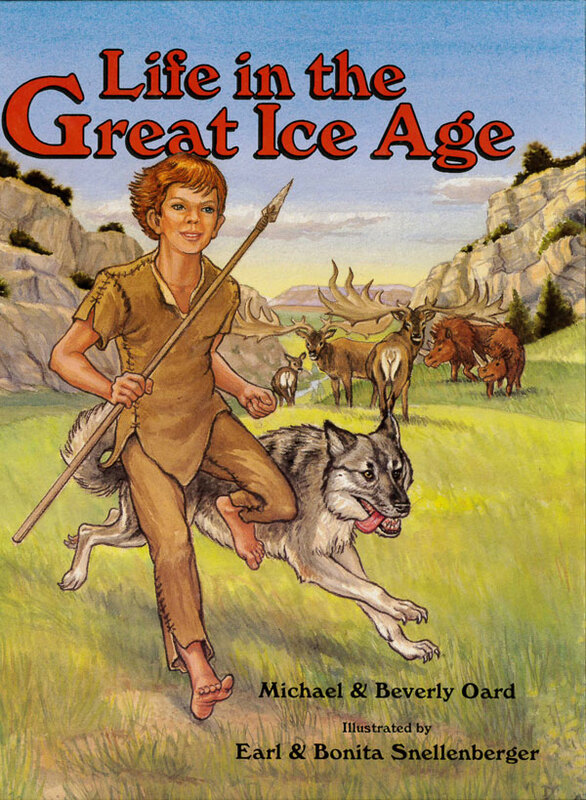 Oard, M.J., Ice ages: the mystery solved? part II: the manipulation of deep-sea cores, Creation Research Society Quarterly 21(3):125–137, 1984. Return to text. Oard, M.J., Ice ages: the mystery solved? part III: paleomagnetic stratigraphy and data manipulation, Creation Research Society Quarterly 21(4):170–181, 1985. Return to text. Oard, M. J., An Ice Age Caused by the Genesis Flood, Institute for Creation Research, Santee, CA, pp. 1–22, 1990. Return to text. Oard, ref. 4, pp. 116–122. Return to text. 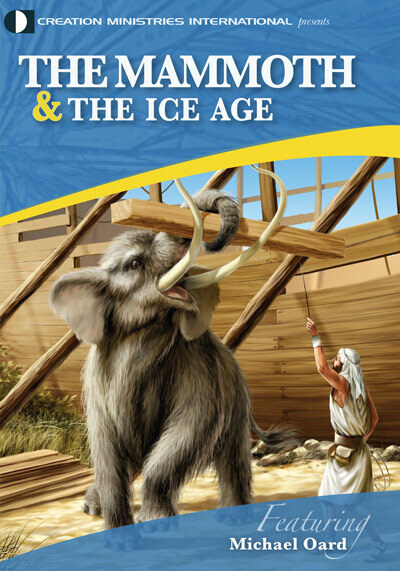 Oard, M. J., Frozen in Time: The Woolly Mammoth, the Ice Age and the Bible, Master Books, Green Forest, AR, pp. 65–68, 2004. Return to text. Ruddiman, W.F., Orbital changes and climate, Quaternary Science Reviews 25, 3098–3104, 2006; p. 3104. Return to text. Kerr, R.A., Why the ice ages don’t keep time, Science 285:504–505, 1999; p. 505. Return to text. Willis, K.J., Kleczkowski, A, Briggs, K.M. and Gilligan, C.A., The role of sub-Milankovitch climatic forcing in the initiation of the Northern Hemisphere glaciation, Science 285:568–571, 1999. Return to text. Paillard, D., What drives the ice age cycle? Science 313:455–456, 2006; p. 456. Return to text. Oard, ref. 17, pp. 33–52. Return to text. Schrag, D.P., Of ice and elephants, Nature 404: 23–24, 2000; p. 23. Return to text. Raymo, M.E., Lisiecki, L.E. 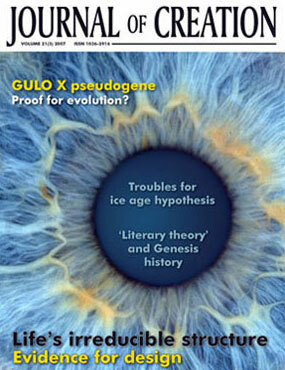 and Nisancioglu, K.H., Plio-Pleistocene ice volume, Antarctic climate, and the global δ18O record, Science 313:492, 2006. Return to text. Paillard, ref. 21, p. 455. Return to text. Huybers, P., Early Pleistocene glacial cycles and the integrated summer insolation forcing, Science 313:508–511, 2006; p. 508. Return to text. Oard, M.J., The astronomical theory of the Ice Age becomes more complicated, Journal of Creation 19(2):16–18, 2005. Return to text. Rutherford and D’Hondt, ref. 9, p. 72. Return to text. Wunch, C., Quantitative estimates of the Milankovitch-forced contribution to observed Quaternary climate change, Quaternary Science Reviews 23:1001–1012, 2004; p. 1001. Return to text. Ruddiman, ref. 18, p. 3098. Return to text. Muller, R.A. and MacDonald, G.J., Glacial cycles and orbital inclination, Nature 377:107–108, 1995. Return to text. Oard, M.J., The 100,000-year Milankovitch cycle of ice ages challenged, Journal of Creation 12(1):9–10, 1998. Return to text. Ruddiman, ref. 18, pp. 3098–3104. Return to text. Hecht, AD et al., Group report long-term ice core records and global environmental changes: in; Oeschger, H. and Langway Jr, C.C. (Eds. ), The Environmental Record in Glaciers and Ice Sheets, John Wiley & Sons, New York, p. 384, 1989. Return to text. Schrag, ref. 23, p. 23. Return to text. Oard, ref. 15, pp. 135–166. Return to text. Vernekar, AD, Long-period global variations of incoming solar radiation, Meteorological Monograph 12(34), American Meteorological Society, Boston, MA, 1972. Return to text. Grootes, P.M. and Stuiver, M., Oxygen 18/16 variability in Greenland snow and ice with 103- 105-year time resolution, Journal of Geophysical Research 102(C12):26, 460, 1997. Return to text. Oard, ref. 4, pp. 121–122. Return to text. Oard, ref. 8, pp. 11–17. Return to text. Broecker, W.S., Absolute dating and the astronomical theory of glaciation, Science 151:299–304, 1966; p. 299. Return to text. Oard, ref. 12, p. 69. Return to text. Vernekar, ref. 38, p. 19. Return to text. Oard, ref. 13, p. 126. Return to text. Shackleton, N.J. and Opdyke, N.D., Oxygen isotope and palaeomagnetic stratigraphy of equatorial Pacific core V28-238: oxygen isotope temperature and ice volume on a 105 year and 106 year scale, Quaternary Research 3:39–55, 1973. Return to text.